By Barbara Dubbeldam, December 20, 2018 at 2:32 pm . 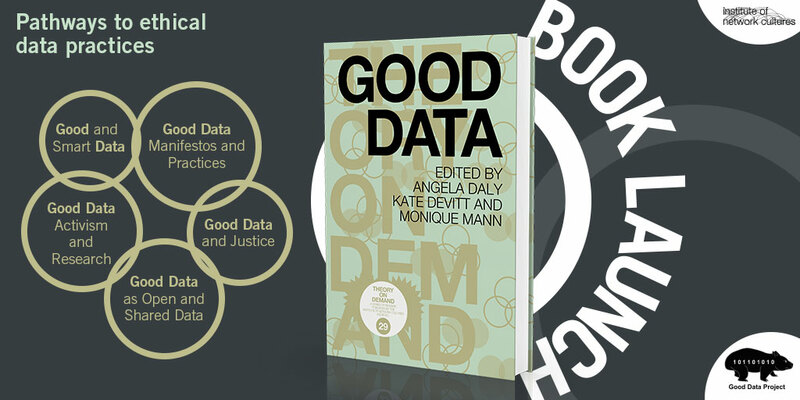 INC is happy to announce that in January 2019 we will publish a new title in the Theory on Demand series: Good Data – Edited by Angela Daly, S. Kate Devitt and Monique Mann. To celebrate this there will be a book launch & drinks on 24 January 2019 – 17:00-18.30 @Spui25 in Amsterdam. The editors Kate Devitt and Monique Mann and member of the DATACTIVE team will discuss the book and open the discussion. Angela Daly?is a transnational and critical socio-legal scholar of the regulation of new technologies. She is currently based in the Chinese University of Hong Kong Faculty of Law and holds adjunct positions at Queensland University of Technology Faculty of Law (Australia) and the Tilburg Institute of Law, Technology and Society (Netherlands). Kate Devitt?is a philosopher and cognitive scientist working as a social and ethical robotics researcher for the Australian Defence Science and Technology Group. She is an Adjunct Fellow in the Co-Innovation Group, School of Information Technology and Electrical Engineering, University of Queensland. Her research includes: the ethics of data, barriers to the adoption of technologies, the trustworthiness of autonomous systems and philosophically designed tools for evidence-based, collective decision making. Monique Mann?is the Vice Chancellor’s Research Fellow in Technology and Regulation at the ??? Faculty of Law, Queensland University of Technology. Dr Mann is advancing a program of socio-?legal research on the intersecting topics of algorithmic justice, police technology, surveillance, and transnational online policing.